The main task of the report was to assess present state of UJITS development and its implementation status. The report was launched on March 20th and covers the developments up to April 16th, 2019. 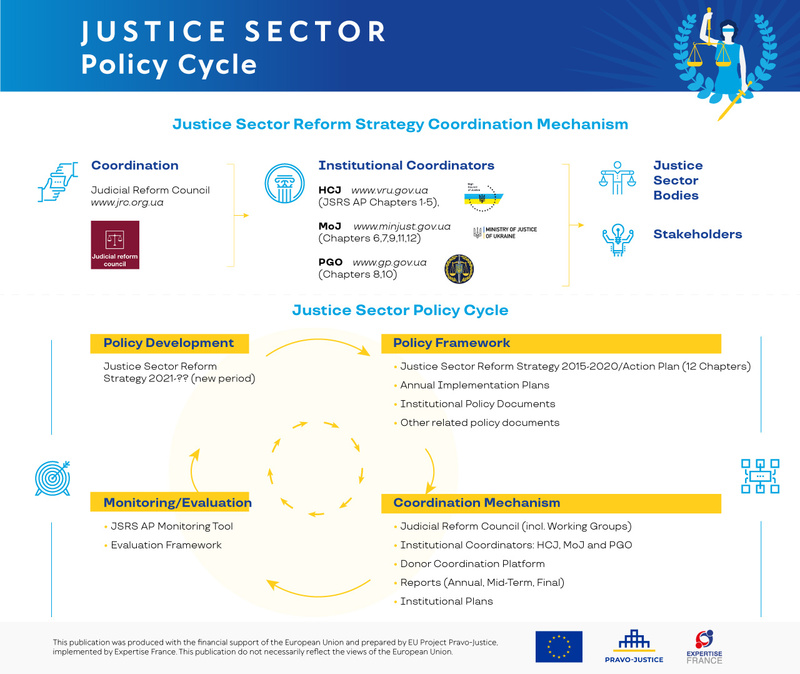 This infographics shows justice sector policy cycle. Following the adoption of the Justice Sector Reform Strategy and Action Plan (JSRSAP) in 2015 and the subsequent constitutional amendments in 2016, the process of the systemic judiciary reset includes an obligatory one-off evaluation (“qualification re-assessment”) of the existing judges to confirm their fitness to continue to exercise their judicial duties. The fact that since 2014 - after the introduction of new procedures of qualification re-assessment - almost 3,000 judges resigned (this amounts to at least 30%, as Ukraine had almost 9,000 judges at the start of the judiciary reset) without waiting for the qualification re-assessment, should be considered among key achievements of the reform. The judiciary reset also involves the selection of new judges, and the creation of new courts. In 2017, following constitutional amendments, Ukraine launched a completely new Supreme Court through open competition. The judiciary reset is being continued in 2018 as more than 6,000 judges and candidates are passing through the selection and devaluation processes run by the High Qualification Commission of Judges (HQCJ). 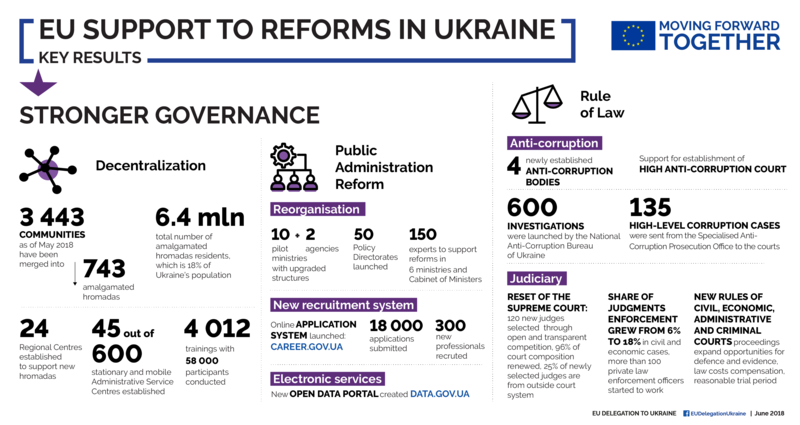 How does the EU support the justice sector reform in Ukraine? For the next 2,5 years EU-funded Project "Pravo-Justice" will work. It is continuation of the EU Project "Support to Justice Sector Reform in Ukraine", implemented in 2014-2017. This Project is funded by the European Union. This website has been produced with the assistance of the European Union.The contents of this website are the sole responsibility of EU Project "PRAVO-Justice" and can in no way be taken to reflect the views of the European Union. © 2018 EU Project "PRAVO-Justice". All rights reserved.